Boskenna is a lovely 5 bedroomed detached house with fabulous views out to sea. A perfect house for large groups who want to get away from it all. The house offers space and comfort and provides a perfect base for a great holiday. There is also a full size table tennis table in an outside building for your enjoyment. A delightful and spacious house commanding superb sea views. It is less than a mile to the local cove of Bossiney – a steep walk down but worth it for the great surfing and rock pools when the tide is out. The coastal paths are not far away and the mystical ruins of King Arthur’s Castle at Tintagel are only a mile and a half down the road. Within 2 miles you will find Boscastle, an historic Cornish fishing village of immense charm and character. The excellent surfing beach of Trebarwith Strand is only 5 minutes away by car and Polzeath a further 20 minutes. 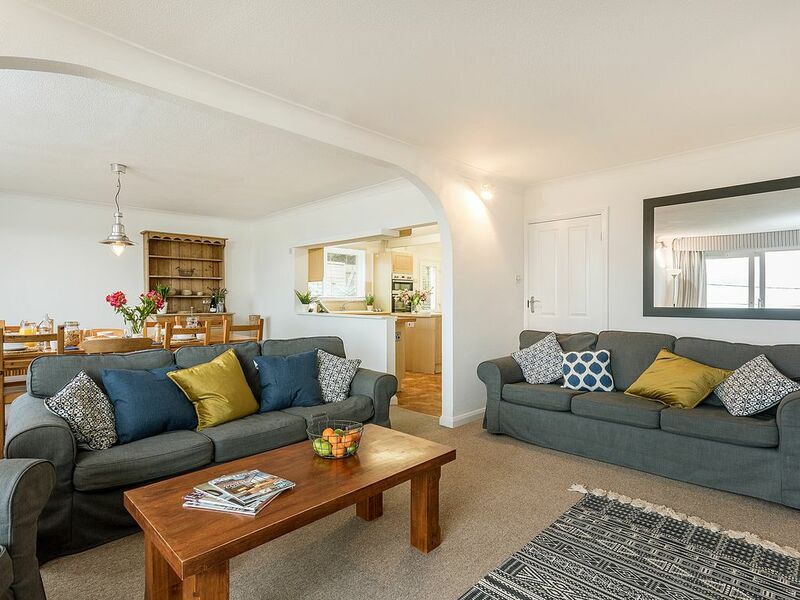 This roomy house is wonderful for families or a group of friends and is a marvellous place to relax and unwind . It consists of an attractive living room, dining room and large kitchen which all have superb sea views. Fabulous patio areas with table and chairs to dine on. The patio looks out to sea and is above the garden where there is plenty of space for children to play in. There is also a full size table tennis table in an outside room for your enjoyment. 2 double bedrooms (kingsize beds). Main bedroom with TV. Sitting room with TV/DVD/CD player and patio doors out to fabulous large terrace great for sunbathing with lovely views. Fully enclosed garden with bbq and full size table tennis in an outside shed. Bed linen (pure cotton) with beds made up. Bath and hand towels. Please bring your own beach towels. Up to 2 dogs are welcomed at Boskenna, at a charge of £25 per dog. The beautiful St. Nectan’s Kieve Waterfall and Hermitage are located just up the road and there are many stunning coastal walks and good pubs/restaurants nearby. Hello, I run a holiday company called Cornish Seaview Cottages which advertises cottages in Cornwall. Having renovated a number of properties in Cornwall and then used them as holiday lettings, I decided to purchase a shell of a house and barn and build a holiday property in France which has had very favorable feedback. We now have a few more properties in France and our Cornish properties are also growing in number. As a small friendly company we have many loyal customers who enjoy staying in our properties and return year after year. We now look forward to welcoming you. Fabulous large space for big family groups. Table tennis and a large patio for BBQ's and entertaining - Plus the amazing seaview. Seaviews from most rooms. Spacious, perfect for large families. Dining room - views to sea Sitting room with TV/DVD/CD player and patio doors out to fabulous large terrace great for sunbathing with lovely views. Large Kitchen with dishwasher, washer/dryer, microwave and all mod cons. Opens to dining area and living room. Very well equipped. Golf nearby just a short car ride away. Notes on accommodation: 2 dogs welcome at £25 each per week Outside: Huge patio area for sunbathing and dining al fresco. BBQ supplied. Pretty garden looking out to sea plus a fabulous full size table tennis table complete the package. Cleaning / Towels / Linen / Maid service: Cleaned for your arrival. Beds made up with Egyptian Cotton bed linen and towels. Please bring your own beach towels. Enjoyed a lovely week in this lovely , spacious property. The views out to sea were just wonderful . We were spoilt by the lovely weather for October so were able to walk and explore the coast path and the waterfall and woods just at the end of our lane . Everything you needed was provided at the house . Hoping to return again . Had a great week at Boskenna, Lovely house, brilliant location....would def recommend. Clean and welcoming with great views and great shared living area. Fantastic location, really welcoming and a couple of minor issues quickly resolved. A great base for a great weeks holiday. We are so pleased you enjoyed the location and had a good holiday! We are glad to hear that any issues were sorted out efficiently. We look forward to welcoming you again. Well equipped, spacious even for a party of 8 adults. Amazing views, ideally situated for many local tourist attractions and on local bus routes. We had a brilliant holiday and were very sad to leave. Thank you for taking the time to write us a review, we are so glad you enjoyed your holiday and we hope to welcome you back again in the near future. Wonderful views, great size, condition a little tired. The size of the property is great and it commands sea views from the living room, garden and the main two bedrooms. The open plan layout is wonderful for the family as you are always together. To be honest the condition of the property is what prevents a 5 star rating, that and the poor tv reception and Wi-fi. The inside is tired and needs some work, there are stains on the carpet in a couple of places, marks on the work tops and most rooms need a fresh lick of paint. You can only rely on BBC on the main tv and this was an issue for the first week of the World Cup! There is a tv in the main bedroom and that has no problems with the reception. Also the Wi-fi is only 2mbs, oddly the router is upstairs which means downstairs you struggle to connect. A quick google search indicates 30mbs is available and with a modern family would be most welcome with a good quality router. The garden is a good size but not very well kept, it looked like the grass had been recently cut for the first time in weeks. The patio furniture has missing glass and a chair leg is rusted and there were also a number of cigarette butts on the patio. We loved the idea of a table tennis table in the shed it’s just a shame the bats were in poor condition and there were no balls. We went out and brought some balls and have left them so the next family weren’t disappointed as well! Just an idea but a blackboard and chalk in the shed would be nice, just to keep track of score. Location, size and views were all great, the condition is what would prevent us going back. The poor TV and Wi-fi would also be a factor, not that we went there to sit inside and watch tv all day but to be able to relax of an evening and keep the children entertained they are essential in this day and age. We really enjoyed our stay here - the open plan lounge / dining room / kitchen is a lot bigger than it appears from the photos with plenty of space for our extended family of 10. Lovely sea views and a short drive to both Tintagel and Boscastle. We were also lucky enough to have some good weather and enjoyed a couple 9f BBQs on the patio. The only reason this wasnt a 5 star review is because it needs a bit of TLC in places (as is thr case with lots of holiday properties), the outside table needs to be replaced (glass missing from one section), garden needs a bit of tidying, the TV reception is temperamental and the Wi-Fi was very poor (it was much quicker to use mobile data). However all these are minor gripes and certainly didn't spoil a great holiday! Thank you so much for taking the time to write a review, all feedback is much appreciated. We're so pleased you enjoyed your time at Boskenna and it's fantastic location, the sea views are so stunning, especially when the sun shines! Following your comments we will of course address the issues you raised and make the necessary repairs. With regards the TV and WiFi, this can be temperamental simply due to the location of the property I'm afraid. It's good to know that none this spoilt your holiday! We hope to welcome you back, kind regards, The Cornish Seaview Cottages Team. Great for walkers and surfers. It is less than a mile to the local cove of Bossiney - a steep walk down but worth it for the great surfing and rock pools when the tide is out. The coastal paths are not far away and the mystical ruins of King Arthur's Castle at Tintagel are only a mile and a half down the road. Within 2 miles you will find Boscastle, an historic Cornish fishing village of immense charm and character. The excellent surfing beach of Trebarwith Strand 5 minutes away by car and Polzeath a further 20 minutes. The beautiful St. Nectan's Kieve Waterfall and Hermitage are located just up the road and there are many stunning coastal walks and good pubs/restaurants nearby. King Arthurs Castle in Tintagel is a must see attractions and there are numerous beautiful beaches all along the coast to visit. Booking Notes: 25% deposit required on booking. Balance due 8 weeks before holiday. Refundable security deposit also required. Please note the rates vary at different times of the year. We are happy for short breaks but please note the price automatically calculated by Owners Direct may not always be accurate. Changeover Day: Saturday Short breaks also available but not in peak in season Notes on prices: Short breaks available. Minimum price £300. Dogs £20 per week.